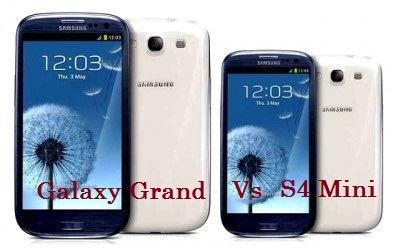 Comparison and Differences between the yet to be released Samsung Galaxy Grand vs the mini version of the Galaxy S4 are discussed here in a tabular form. Samsung has had great success with Galaxy Grand and as well as Galaxy S4 so it is going to release a smaller and cheaper version of its S4 smartphone, this was announced on May 30th. Galaxy S4 mini pricing is not yet known but looking at the features it should be placed slightly above the Galaxy Grand. With higher resolution and a better processor it will surely be a good smartphone living up to its bugger bigger counterparts standards.